Many couples live with the ache of not being able to have children. Malcolm and Nick Cameron are writing from such a background themselves. 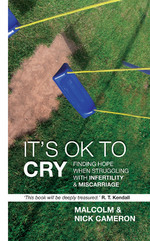 This book tells of their struggles as they coped with years of infertility and will take you through the story of their miscarriage and the task of piecing their lives back to together afterwards. Throughout their ups and downs, and amidst the heartache, Malcolm and Nick have been carried through by God, and emerged on the other side stronger than before. This book will help you whether you are going through a similar situation or if you have a friend or family member that is facing the heartache of longing for, or losing, a baby. As Christians too often we are unwilling to share our experiences with others, not realising that there are countless couples in the same position, longing for a child, confused by 'why them'. Here Malcolm and Nick Cameron have produced an honest and real account of their experience. They do not claim to have the answers as to how you should deal with infertility or miscarriage, but they can point you to the one who does, our Heavenly Father who never leaves us, and draws alongside us in our times of sorrow and pain and is there to pick us up when ever we fall.